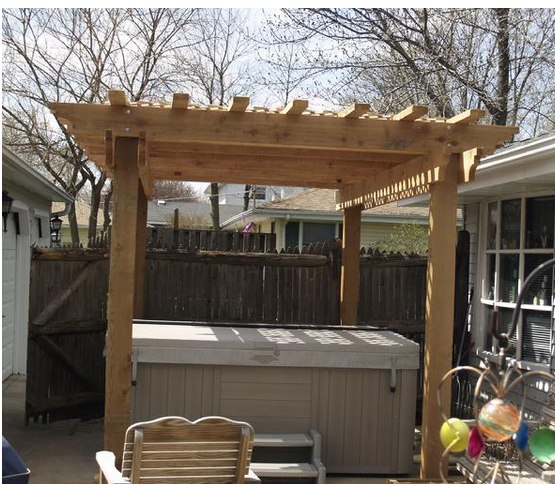 As you make your way around your neighborhood or the internet in your search for pergola plans and ideas for different possible designs, you might notice that they are quite popular structures to place around back yard water features. You can get very creative when thinking about where to place your pergola and what shape and size to use. The example above is a corner wrap design. It almost looks like two separate pergolas but the roof pieces do connect in the back. It is still a very simple design though with standard square posts on concrete, and single layer beams, rafters and slats. The overhang is quite short and end cuts are very basic. You will notice that the majority of waterside pergolas will be made with a white vinyl material. This is the best type for withstanding the excess moisture of a pool or spa. It is a little more expensive at first, but then upkeep is minimal with no cost. Just hose off the pergola to keep it clean, but you wont need to reapply stain or treat it. 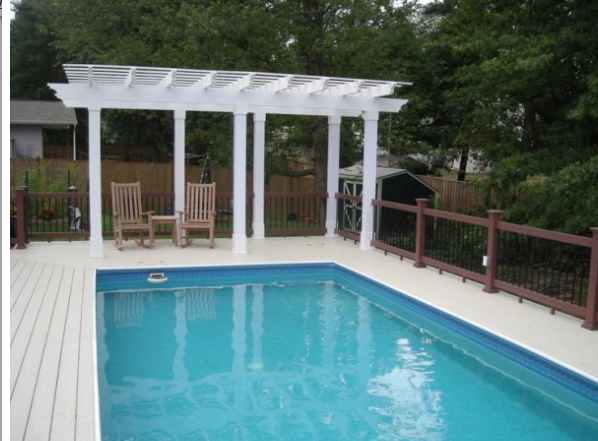 The pergola above on a deck at the end of the pool is designed to match the pool’s rectangle shape. Six square posts are secure to the deck. Again the roof design is simple though the edges of this one have a more sharply angled cut and longer overhang. There are times, of course, when wood is just what you happen to want and it also looks beautiful at the edge of a pool. 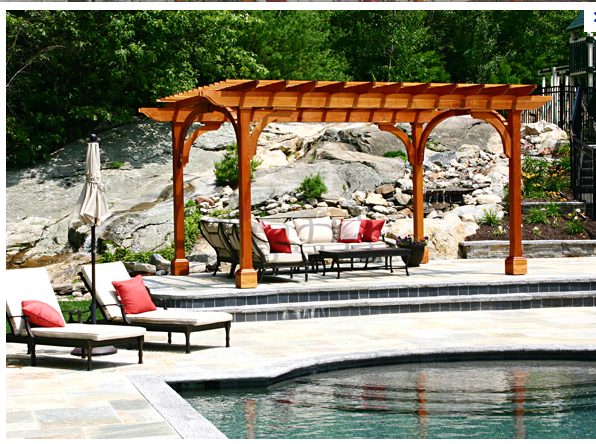 The area surrounding the pool in this yard is a perfect compliment to the cedar pergola. The four post design is attached to the concrete with some nice base trim pieces and supporting knee braces between the beams and rafters that provide a more complete, elegantly curved look. The roof line is again, otherwise quite standard with just one layer of rafters and slats to provide just the right amount of shade for the seating area. This pergola design is something you typically see at a resort. It is just there for style and does it ever work! The curved vinyl design set up on pillars provides a very regal boundary at the edge of the spa and pool seating area. There is no real shade being provided here since it is just a single line of posts holding up a minimal series of rafters on the curved beam. Extended trim pieces at the tops of the posts deliver additional style and support for the beam and rafters. 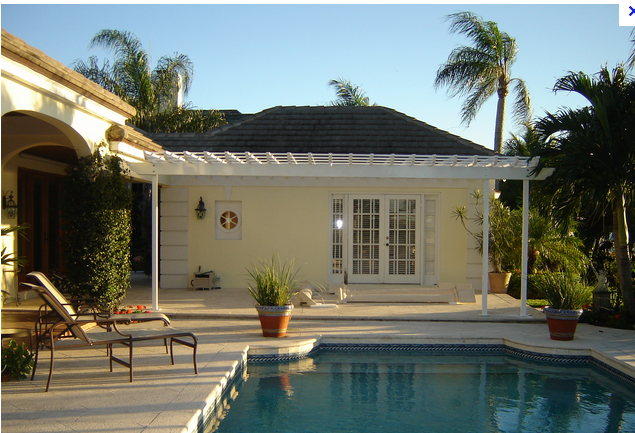 Bringing it back to a more useful example – the attached vinyl pergola above is a classic. The roof line is again quite simple, but the slats and rafters are cut a little thinner than usual and placed closer together to provide more shade. 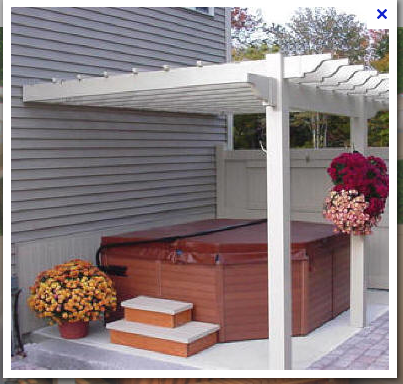 Spa pergolas are truly inexpensive and easy to build. They typically have to cover a much smaller space such as the one above. The attached pergola with two square posts attached to the concrete only has 7 slats and 7 rafters so the material cost is quite low. The labor to build this would also be minimal. Two people could most likely put it up in one day. Just like with pools, sometimes you still want to see wood around your spa, Pressure treated pine is the cheapest and as long as you are willing to spend a day every few years re-treating the wood it will last just fine. 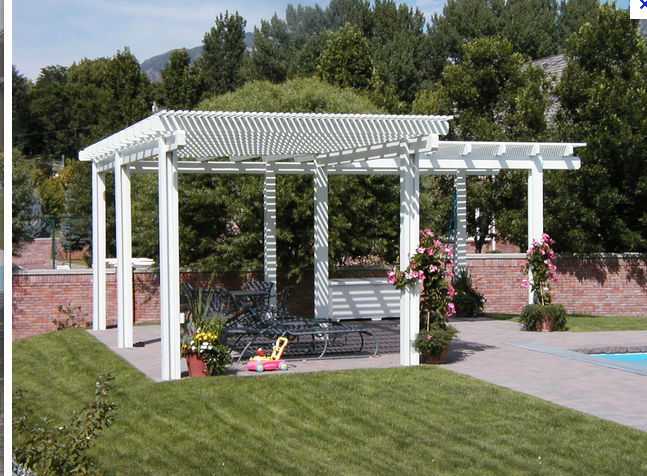 This is a very simple, four post square pergola with nice, thick roof pieces for maximum shade. This one could also be put up in one weekend by two people quite easily. The spa pergola above is a little fancier than the others of course. This is a beautiful blend of different materials for the deck, fence and pergola. The posts are actually secured in the ground between flagstone pieces. You cannot properly secure a pergola on flagstone as it doesn’t provide sufficient stability. It’s best to remove the stone to dig holes for the posts. There are nice trim pieces added here on the posts and the top and the bottom including caps to match the fence posts. Like the previous two examples there is only one row each of 7 rafters and 7 slats so the basic pergola itself would not cost much more in materials or take much longer to build, if at all. If these designs have inspired you, I encourage you to take a short survey and sign up for this email series and follow the steps to claim your free pergola plan and then to get the discount for the Guide to Building a Pergola in One Weekend. 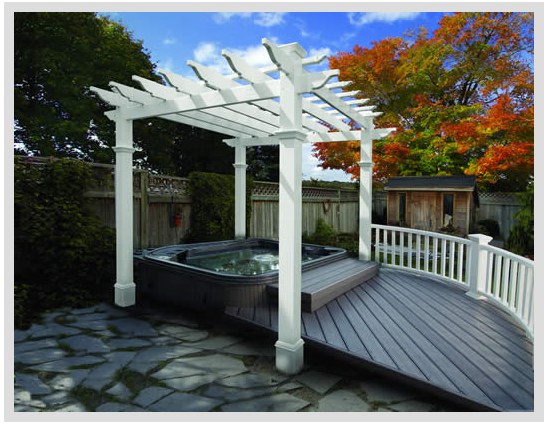 With all that information in hand, you will have what you need to create your own poolside pergola or spa pergola. Author of How To Build a Pergola in One Weekend. Member of the PergolaDIY team who feels like they have learned every hard lesson there is to learn about DIY pergola building! We share our knowledge so you can complete your projects without any bumps or bruises. Really!